Happy 4th of July everyone!! I am proud to be an American but this is the first time I'm actually showing my patriotic side =). I did 2 looks.. one on each half of my face. Read on for product information and more photos =). I have no idea what that thick line near my inner corner is.. I don't remember doing my eyeliner thick. Oh well, please ignore it lol. The numbers on my lid correspond with the numbers on the product photos. I did not realize that Vanilla would come up yellowish in photos. It looks more like a shimmery white in person. I hope you guys liked this make up look and was inspired to do your own 4th of July look if you have not! 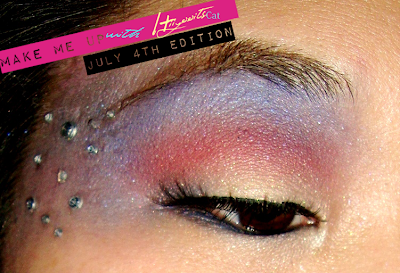 Stay tuned for more Independence Day Editions! very beautiful, so creative too!!! love it! very pretty reminds me of a fairy.